Rhubarb season is past, but I cannot resist sharing with you a couple of excellent discoveries I made with rhubarb for a couple of early summer parties. You might still be in the mood for rhubarb, with its wonderful, tangy flavor, offering so much possibility but most often relegated to that good, but a little repetitive rhubarb crumble. A good cheeseboard is always in need of a tangy, acidic fruit contrast. For a generous cheeseboard I laid out for an early evening cocktail party (in an outrageously beautiful setting – a green clearing on a cliff overlooking a lake), I offered a large, open jar of rhubarb and apple chutney. No one knew what it was but courageously dove in anyway and spooned dollops onto the top of the chunks of cheese on crisp bread. Rhubarb seemed logical to me with cheese and the apple was a little additive to reduce the sting of the rhubarb and make the chutney a bit smoother in texture – more comfortable, perhaps? My very own harvested honey made all of the difference – raw honey rather than sugar really makes this topping into the delight that it is. Place all ingredients in a non-metallic pan (important to cook rhubarb safely in – read more!). 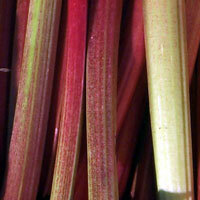 Allow to cook for a half an hour over low heat, or until the rhubarb is soft enough for the blender. Place the mixture in a food processor and mix until smooth. Spoon into a clean jar and seal. Serve on a cheeseboard with celery that can also be dipped into this divine mix. At one of my early summer dinner events, a number of the guests were vegetarians, and it struck me that making a curry with lots of wonderful fruits and nuts to scatter on top would be just the thing. The idea of making a curry with rhubarb as a base wouldn’t leave me and so I decided to make my guests guinea pigs and try it out. The outcome was striking – not sure I’ve ever enjoyed curry as much as I enjoyed this one. Sauté the onions, crushed garlic, grated ginger and curry for 2 minutes. Add the celery and the rhubarb and sauté for a further 2 minutes. Add the apples and pour over the stock. Season with salt and pepper. Allow to simmer over low heat for 20 minutes. Add raw honey and adjust seasoning. Cook for a further 5-10 minutes. Serve with bulgur, couscous or brown rice mixed with sunflower seeds. Provide a smorgasbord of condiments: banana sprinkled with lime, dessicated coconut, cashew nuts, slivered almonds and whatever else you can think of that might up the flavor and texture experience!